In an apocalyptic scenario, you may find that brain tanned hides are a viable and long term solution to your clothing and footwear needs. You will naturally put aside stores of clothes as part of your preparations, but after a few years without new supplies, even the best darner in the country won't be able to stop your clothes from falling apart. This is when you'll need to go back to basics and be able to make clothes from your own resources. Brain tanning offers a natural way to protect your clothes against the elements. Create the leather - as with any kind of hide production, you'll need to become skilled at skinning animals. This isn't as easy as it sounds as you'll need to be able to cut away the top layers of skin without catching any muscle or fat as this will rot away making your clothes unusable. It's also at this time that you'll want to cut the skin into the rough shape that you want as the skin will still be stretchy and pliable. You will also need to cut off any features, such as the tail or legs, that will make the skin difficult to change into clothing. Evaporate the moisture - once you've got the skin, you then need to clean it and stretch it. Cleaning it means getting rid of all the hair, as the follicles trap moisture, while stretching it out helps to open the pores, which will help to evaporate all the natural moisture trapped in the skin. The skin at this point will become very brittle, so it's important to keep it somewhere safe while you're drying it so that it doesn't get ruined by the elements. Boil the brain - if you're at all squeamish, then making brain tanned hides isn't for you. As the name suggests, you'll need to keep the brain of the animal that you killed aside. Boiling the brain in water releases a chemical called lecithin, which is what is used to tan the hides. Once the brain has dissolved, you simply rub the mixture into the skin and leave it to dry. Interestingly, most animals whose skin is used to make hides have exactly the right amount of lecithin in their brains to tan their whole skin. 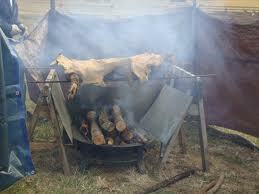 Smoke the skin - once you've allowed the brain mixture to dry, you then need to smoke the hide to trap the moisture in. You'll need a smokehouse of some sort where you can keep a low-level fire going with the skins being hung in the smoke above the flames. 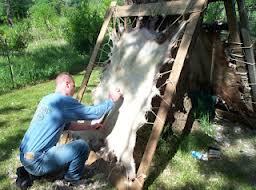 This process seals the tan and makes the hide water proof for years. Of course, there is a lot more to the tanning of hides than is discussed here, which is why, if you want to take your research further, you should find a local craftsperson to teach you the trade. The main reason for learning to brain tan hides, compared to learning to tan with synthetic products, is that it means that you can be completely self-reliant, using nature's chemicals to do your work for you. In a survival situation, the more that you can do without requiring manufactured products the better, as you don't know when you'll next have access to them.